Those very words were shouted on Friday morning at roughly 8:40am as we drove out of the city where I was born, where our kids were all born and where Liz had made her home for the previous 19 years… the trip had begun. Weeks of saying goodbye had come to an end and we began the long road to Montreal. Below are some VIPs (very important people); some are from church, some are business connections or service providers and others have been friends for a long time. It’s impossible to post pictures of each of you and in some cases, when we got together to say goodbye, we forgot to get a photo, but each of you are important to us. You are a gift from God to us. You have contributed to who we are. Departure: Friday we drove Saint John – Montreal, but today we leave Montreal for France. It’s a big day and we are so excited. Finances: Two days before our departure, we received a call from someone who made a $200/month PIM commitment for the first year of our stay. What an encouragement that is… bringing our total commitment to date up to 83% or just over $99,000 of the $120,000 required for a full 2-year stay. Car: the car is now sold and a pastor friend of ours now has an awesome second car! House: Incredible news… the night before our departure from Saint John we had an initial offer on our house. The negotiating process ran it’s course and as of yesterday morning, we have accepted an offer on it. THAT is IN-CREDIBLE timing. We thank the Lord for another open door! Luggage: We ended up not being able to stuff everything into suitcases as we hoped to so we shipped 3 totes and 2 suitcases via Air Canada Cargo. There was a 110kg limit before you moved to another fee-structure and, without even trying, our total came to 109kg! PHEW! …again, the hand of the Lord. As you can see… the car was FILLED with the remaining suitcases (and the picture was taken BEFORE the guitar went in!). The next time I write to you, I will be writing from France… how exciting is that!? Please pray that things go smoothly at customs upon our arrival in France. It will not be a problem to bring in any of the suitcases that traveled with us, but pray that there are no hiccups at cargo (no extra import fees, duty, etc.). Thank you for your support, God bless you as you gather to worship Him today!! Recently, while looking for something to do with how to be an encouragement to MKs (or in our case, AIMKids), I came across this information from the UPCI’s MK Ministries. It’s wonderful so I thought I’d share… Check out their website to get a whole bunch more information on ways to support & encourage MKs – they are a unique bunch of kids… far from home because of the call of God on their parents’ lives. Thanks for being interested in MKs / AIMKids and seeking how to be a help and an encouragement to them! You can change a life through this interest! I’ve stated that the goal of AIMLong.ca, during the time leading up to our departure, is to keep you up to date on the progress of preparations. So for now… here’s how the hive has been humming! House & Car: The house is still for sale and while there is no firm offer, there is someone who wants it but they will have to sell their own house first & it goes on the market in January. That can cause us some anxiety if we focus on it, but we try simply to stand still, and trust in God’s faithfulness. We’re thankful to already have a buyer for our car. Work: My replacement as Assistant to the Pastor at Mission Point is now onsite. Mark Robertson (originally of Hatfield Point but most recently of Miramichi) and I have been working very closely in an attempt to get 8 years worth of stuff out of my mind and into his (poor guy!). I can tell that he is going to do an incredible job and is a credit to the pastoral leadership that has trained him to-date. Pentecostal Messenger: For those unaware, I’m editor for a 12-page printed publication that goes out to our churches in the region, with a readership of roughly 750. While in France, others will look after logistical details, but I’ll still look after editing and layout of the content. I’ll be putting together the better part of both the January and February issues prior to my departure. On Monday we got to spend the afternoon with our friend and missionary to Guatemala, Lynne Jewett. What an inspiration! 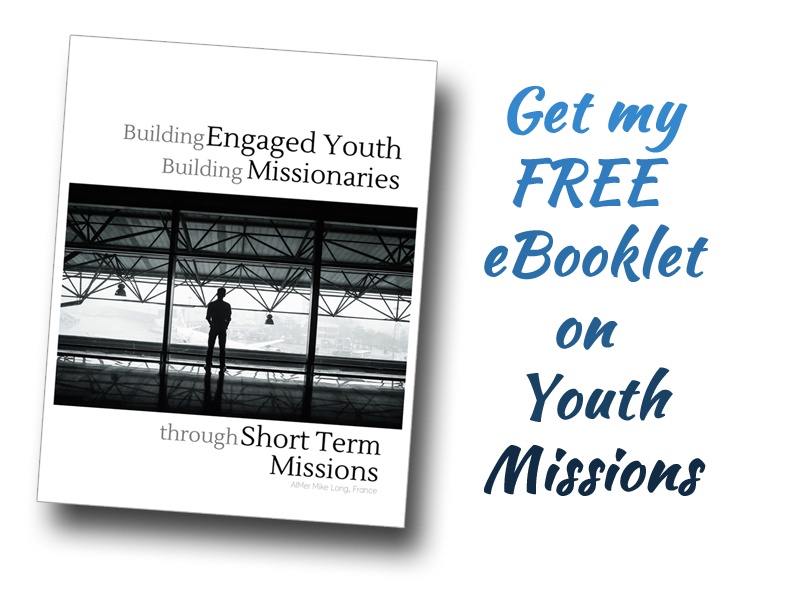 b) doing all we can to set our own kids up to succeed on the mission field. Departure: We’ve tentatively set our departure date as somewhere around January 25-27. “Wait, what? …no specific date?” ….We’re going to fly stand-by, which means that, yes, we’ll save money on airfare but we’ll fly according to seat availability. (If there are seats available, we’ll seat our seats on the plane, if not… we try again next flight). That may seem stressful to some, but it’s how we traveled the whole time Liz worked for the airline, so we’re used to it. Final Mailout: We’re on the verge of doing our final mailout prior to departure. It’ll be an oversized postcard for Sunday School & Youth Staff, focusing on “adopting our kids as a “prayer project” and various way to pray for & connect with them / us. Look for the infographic in this Saturday’s post. It goes without saying that, with all of these things going on… we need your prayer. It all comes at a busy time of year and if I were to focus too much on it, I would be overwhelmed. We take one day at a time and rest in the assurance that, if the Lord tarries, we will be there in just over 5 weeks from now! Here is a look at the timeline detailing how God connected us to French-speaking Europe and eventually western France in particular… over time. Can you see the hand of the Lord at work, leading, guiding and preparing things in advance… leading us, over time, into the center of His will for our family? If so, we are still in need of financial partners whose gifts will enable us to advance the Kingdom of Christ in the city of Châtellerault. Would you consider partnering with us? Click here for a Partner Form and instructions on how to go about supporting our family. Thank you for your prayers… by them, you too are par of #Revival_inFrance! The second, related to you dear readers! Long-time followers will remember that in March, we mailed out 210 information packets to pastors around North America, introducing ourselves and asking for support. Well, this past Saturday I finished doing a second mailing. Whereas March’s mail-out contained a letter, bookmarks, a Partner Support form and a handwritten note, this one contained only a postcard, the front of which was customized with photos of our trip and the back of which gave a brief overview of our time there. While it will be a shorter read for the recipients, it still took me a couple of weeks to prepare because I included a short handwritten note on the back of each card as well. Crazy? Perhaps… but do you enjoy getting a mail-out that’s strictly generic? Not me. Even if a church or pastor is unable to support us financially at this time, the photos on the card make it another great prayer-prompt. Prayer is always in order! Now… on to you dear readers! I was looking at the stats for this blog the other day (not always a good thing to do when you’re a new blogger… it can become easy to obsess) and I was pleasantly surprised at the traffic that has been coming through. The picture below shows the stats for the last thirty days. This breakdown is not surprising, all things considered. If I were to show you the stats for views since the launch, one thing that would be quite different is the group of countries that follow the top three. The numbers above show that Brazil, Guatemala, Italy, Portugal and Madagascar as the next five. All-time stats however show Belgium, Brazil, Netherlands, Denmark and Guatemala as the next overall top-5 sources of traffic. Regardless of placement on a list… we want to say a big “Thanks!” to each of you for continuing to visit the site and stay on top of our plans & preparations. Although I say “our” plans… we’re cognizant of the fact that we’re just living out the Lord’s plans. Cards: As these latest cards fall into the hands of pastors across North America, please pray that many, who are not already supporters, would be favorable to helping us financially in some measure. Pre-Moving Sale: This Saturday, we’ll be having our first “Pre-Moving Sale.” We’ve begun sifting through 17-years worth of accumulated things and will be putting them out for sale in a garage sale. It’s not only to raise a bit of money, but also (and perhaps more importantly), to reduce the amount of stuff we’ll need to store when we leave. Would appreciate your prayers concerning both these things! Thanks so much… See you Saturday!